Last year I did a fun end of year review, and although it may not be everyone’s cup of tea, I love the rite of stting down and remembering all the things that happened in the last tweleve months! Especially as I don’t always get a chance to record those thoughts or events in my actual journal. Graded a pattern ~ more on that one later. Turned 30 ~ haha! But really, I haven’t done it before! Started drinking coffee. I never used to ~ it gave me migranes and I am a tea girl through and through… But with three little ones under five, and thyroid issues… I caved. It was either that or take four hour naps every afternoon, and who has time for that? Yes ~ well, sort of… So I only made two goals for 2015 ~ to be more mindful, and to sew more. While I struggled with mindfulness all year, it certainly was on my radar and it was something I was working towards. So I guess I sort of did it; but not to the point that I’m set. I definitely have to keep working at this. Number two ~ sew more. I certainly did that, but I don’t know if this was such a helpful goal. I think I ended up putting more pressure on my sewing, and that stressed me out, which made the sewing harder, and so on and so forth… Or should that be sew on and sew forth?? The point being: I found out that I can’t be that much faster with my sewing or bad mistakes start to happen, and also I will burn myself out if I try to do a big stretch of projects over the year ~ like I had planned for my sewing all the things. Though really, that title alone should have given it away! None. Again. *sigh* One year! 4. How many different places did you travel to in 2014? Not much in terms of traveling, but we did go to Sydney three times this year, and the snow fields for three day trips. 5. What would you like to have in 2016 that you lacked in 2015? More humilty to lean on God when I need help. This year has been a bit rough at times. 6. What date from 2015 will remain etched upon your memory, and why? 16th of Feburary, 2015 ~ when we got to meet our baby girl. My 30th birthday! And all the resulting parties ~ so October. May the 9th because I got meet Nora of Nora Finds and A Wild Tea Party, and of course, the 14th of November, because it was the first Aussie Vintage Girls Meetup, and I just had a blast meeting all the lovely ladies and hanging out with them! Not keeping up with healthy eating habits or the house work… We have slipped back into very bad habits of eating heaps of takeaway, and don’t get me started on the continuous loads of wet washing that have been sitting forgotten in the machine or the washing basket!! Mostly just hay fever ~ we seem to be keeping well otherwise. My overlocker. That thing is awesome. I love how neatly it finishes everything up inside! Meeting Nora! 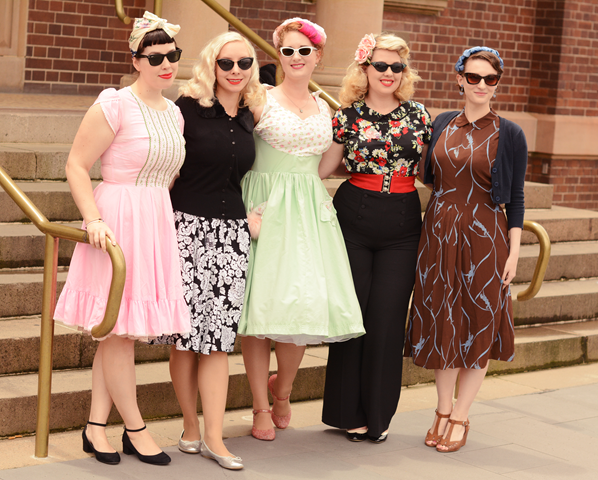 The Fifties Fair! 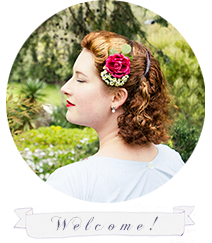 The Aussie Vintage Girl Meetup! Moving my horse to a new equestrian facility!! So many fun things! i. happier or sadder? Happier for sure. I’m not pregnant. Lol! ii. thinner or fatter? Thinner; again, not pregnant. Fatter; I can’t fit 80% of my wardrobe. The struggle is real. iii. richer or poorer? Richer. I have so many wonderful people to enjoy life with! And I’m grateful that my Savior never lets me go. Eating bad food. Comfort/stress eating. 15. What was your favourite tv show? I’ve not really had any ~ but we have been watching Hawaii Five-0 and it’s been fun. 16. What was your favourite film of this year? 17. Where were you when 2015 began? 18. Where were you when 2015 ended? In my bed, at home, fast asleep…. Haha! Life with little ones, that’s all I’ve got to say about that! 19. Who were you with when 2015 started? My little family, and extended family on my side. 20. Who were you with when 2015 ended? Can’t think of that stood out, so ~ I don’t have one. A spot at an equestrian complex that has everything I could wish for!! Didn’t think I’d get in as there is a long waiting list, but a last minute spot popped up and we are settling into our new home. It’s fabulous! I went out on a lunch date with the Mister, and we had a burger at our favourite park sans the little people. It was lovely and relaxing. I reached the big 30. Not that you can miss that ~ I must have mentioned it a dozen times by now! Hanging out with good friends, my Mister, cups of tea, horse riding and prayer ~ same as last year, but you can’t beat it! 27. Whom did you miss? I actually made a bunch of new friends and was able to hang out with lots of different people aa bunch of times this year ~ that’s been so wonderful! However, my sister-in-law was over in the USA for a long time, and I missed her a lot. 28. Who were the best new people you met? Slow down. If you rush, you make mistakes. You might have a lot to do, but if you are calm and systematic, it’s more likely to get done smoothly than if you rush around like a turkey with your head chopped off! 30. What are your plans for 2015? Work on cleaner eating, better housekeeping practises, maintain my 3-4 rides a week, try out Working Equitation, maybe start looking into a business plan of mine that been on the backburner ~ basically, work hard and go for it!